It doesn’t get much crazier than this bike. Luggage rack on the back, and god knows what’s going on with the forks. 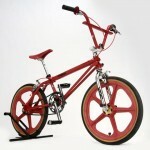 Let us know if you rode one of these, had a buddy that did or if you just wanted one. 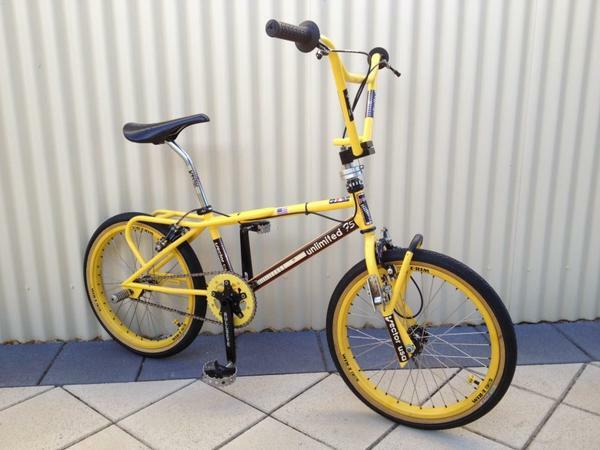 You can check out more photos of this bike and it’s crazy standing areas on BMX Museum. 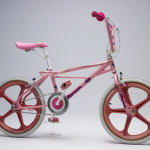 This entry was posted in Bikes and tagged 1984, BMX Museum, Unlimited FS, Vector. Bookmark the permalink. I’ve got a white one of these in my parents garage, still in pretty good shape. I was surprised they kept the old thing. I have a NOS white frame and fork set of this Vector freestyle BMX and dayglow green matching handlebars. 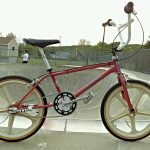 I found it storaged for years and collecting dust at a local bmx bike shop. So it has never been sold, it never got used and was – of course – never ridden, because I didn’t have the heart to build it up. Jeeezus christ, what the hell where they thinking? 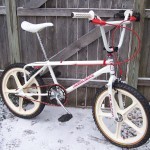 Never had one of these, but lusted after, and bought, the race bike they produced. Terrible contraption. The headangle made it turn like a tank in corners, washing out at the flick of a wrist. Snapped the handlebars in two days. Jesus, they were crap.